Get a question a day emailed to you. 11-November-13 / James Callan / Comments Off on Get a question a day emailed to you. Brand-new thing for November 2013: A Question a Day via email. Every weekday, I’ll send you one trivia question. Don’t worry, you get the answer, too — but in the next email, along with a brand new question. It’s a cycle. Oh gosh yes please send me a trivia question every weekday. You might learn something new. You might find out how much you already know. You might get something to think about. I might include more stuff in a given newsletter — bonus questions, facts, factoids, cactoids, links, etc. — but I won’t send email to this list more often than once a day. And I try to keep ’em short. And spam? Ugh. I won’t send it to you, and I won’t give your email address to anyone else to send it, either. Name the movie: In the final scene, a mother of two reveals that she’s pregnant again when she unveils a hand-knit, three-legged baby outfit. 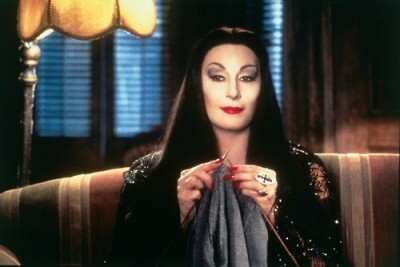 The Addams Family And in the next movie: Pubert! Who doesn’t have three legs, as it turns out. I expect a detailed explanation from Addams Family mythkeepers. Tricoteuses were women who would knit while sitting and watching what macabre machine do its work? The guillotine. A tricoteuse would hang out in the Place de la Révolution during the Reign of Terror and knit while watching heads roll. (Now there’s an app for that.) Madame Defarge is a famous example, but encoding messages in their knitting is not a requirement. Natalie Toro as Madame DeFarge, with company, in A Tale of Two Cities. What nonprofit organization recently sent a cease-and-desist notice to Ravelry.com when they noticed that the site’s annual competition included events like the “afghan marathon”? The United States Olympic Committee. The USOC claimed that the “Ravelympics” was “disrespectful to our country’s finest athletes.” After a flurry of protests, the USOC has apologized and withdrawn their complaint. What literary transplant recipient made a full recovery after receiving a donor heart “made entirely of silk and stuffed with sawdust”? The Tin Woodman, in L. Frank Baum’s The Wonderful Wizard of Oz. In the movie, his new heart is a heart-shaped clock, and he just needs to carry it, not have it transplanted. Which Nirvana song inspired the name of Joe Hill’s debut novel, in which a rock star buys a haunted suit that comes in an unusual package? According to the first line of his untitled poem, where did Stephen Crane come across a “naked, bestial” creature eating its own heart? And how did it taste? This all happened in the desert. And the creature liked the heart because it was bitter. And because it was its heart. In what early ’90s sitcom did Markie Post and John Ritter fall in love in D.C., get married, and move to a small southern town in the second season? If you’re playing Hearts according to Hoyle, what card is worth 13 points if you take it in a trick? The queen of spades, which is why the game is sometimes called Black Maria. In Ed McBain’s novels about the police of the 87th Precinct, the island of Isola is a fictionalized version of what real-world island? Isola is also the name for McBain’s version of New York City; its other boroughs are Bethtown, Calm’s Point, Majesta, and Riverhead, corresponding to Staten Island, Brooklyn, Queens, and the Bronx.